EzyRez is committed to providing the highest quality on-line ticketing system currently available to you, as well as a high standard of service from our helpful team. We are working tirelessly to provide products for you to sell through EzyRez, allowing you an easy way to make great commissions. The system features an automatic log in to TicketMates, and a seamless charge to the guest's account. EzyTours is included in your monthly EzyRez subscription. TicketMates ExperienceOz now embedded into EzyRez Online Premier! 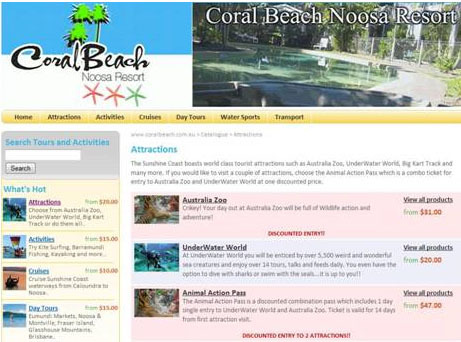 The system prompts guests to book their trips and tours on successful completion of an online booking. It’s all about increasing add on revenue, as the system will load each resort’s specific TicketMates Experience site direct from the booking confirmation to ensure every ticketing opportunity can be realized. EzyRez leads the way in online connectivity, and is again at the forefront of working with new technology to ensure maximum benefit for all EzyRez Online Premier users. Make it Personal! We can upload your own web banner to personalise ExperienceOz (see example).